The seventeenth day of our journey will be different from the previous days, though it also has a major climb of about 400 m elevation gain, once we get out of Saint Marcellin -- a town I only know for its cheese until now. Before we reach Saint Marcellin, there's some extended downhill riding as we fly down from 900 m to 200 m.
The purpose of the following climb is to shorten our route north. 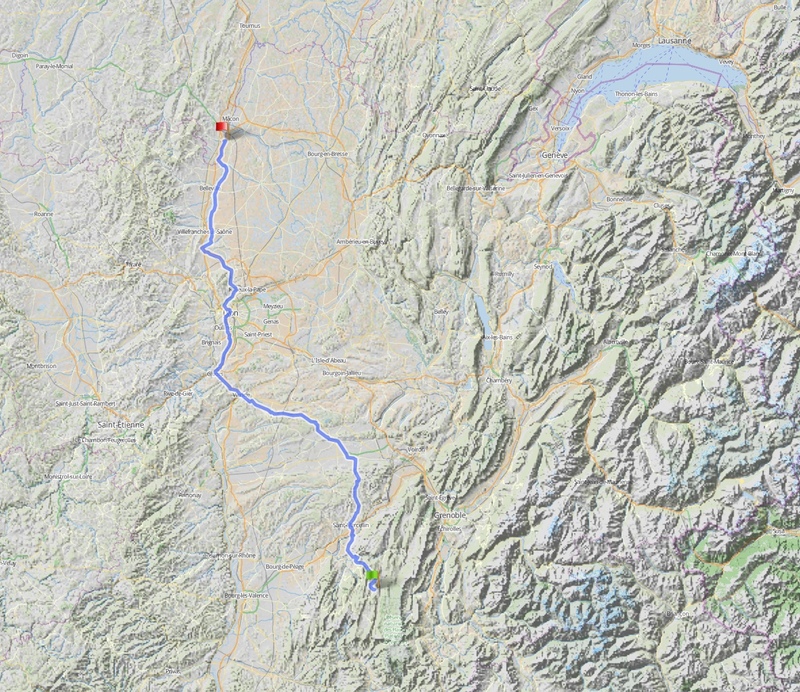 Instead of riding many km in the rather busy and industrial valley of the Rhône, we will take a journey across the country. Still there will be more villages and towns as we had seen the past two days, more traffic too, but surely less so than down by the Rhône. Leaving La Chapelle, we will first enjoy a great downhill. 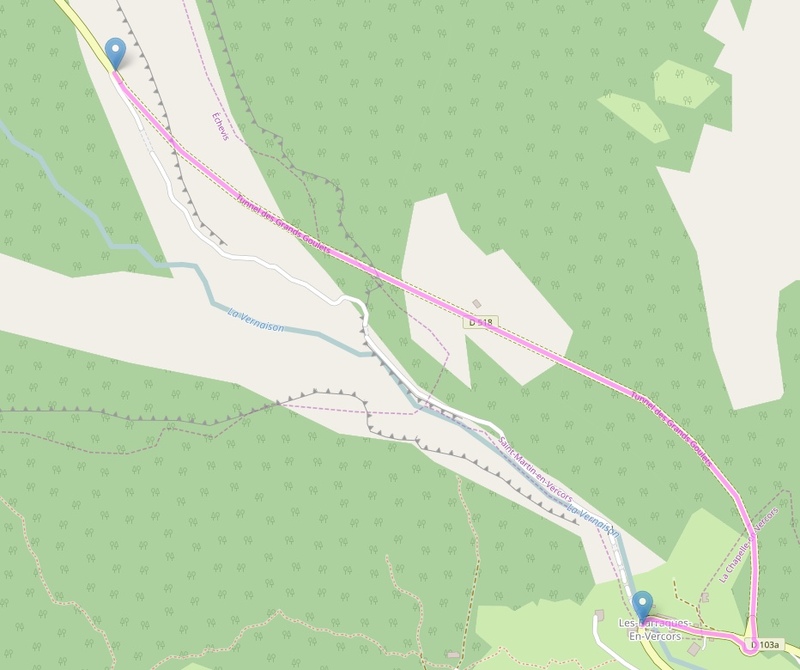 A Swiss rider has advised to take a stop at Les Barraques to take a look at the old road now closed for secuerity reasons — on the map here it looks like a section of the road is missing further down. As a bypass we will take the tunnel as indicated in the small map. About 110 km into the ride, the tour will reach Vienne, a town of some 30.000 inhabitants on the river, which will mark the beginning of the second part of the day. I suggest to take a lunch break here, somewhere by the small bridge across the river (see picture, we should be able to cross over there). The afternoon ride will be in the Valley, much busier compared to the morning and with more traffic, so take care and be mindful. The major challenge here will be the passing of Lyon. The track will take you right through the heart of town, which is the route with the least climbing. Before leaving the Rhône in favor of the river Saône, I suggest to take in a bit of the atmosphere of Lyon, the third largest city of France if I remember correctly. Beyond the city I have taken the climb out which we would have to face at Neuville for the direct route north. Instead we stay a bit longer on the West Bank of the river up to the town of Anse, where we cross to the east side at about 175 km into the day. The remaining 40 km will become less busy by the km, more countryside and river meadows to our left. The destination is Crêches-sur-Saône, the camping is just beyond the bridge across the river. After two short mountain days, this was again a full day with good climbing as we have done them in the first two weeks. Since it is the final week of the tour, we have now earned ourselves what lies ahead: two days with under 130 km and not much climbing at all, to enjoy the famous wine villages of Burgundy.